An editor/colleague of mine buys herself at least one new winter coat every year. She believes it's the most important element in her winter wardrobe. I agree with her: it's what you wear day in and day out (in the colder climes, at least). It defines you and your style. And it adds a finishing touch to your outfit. 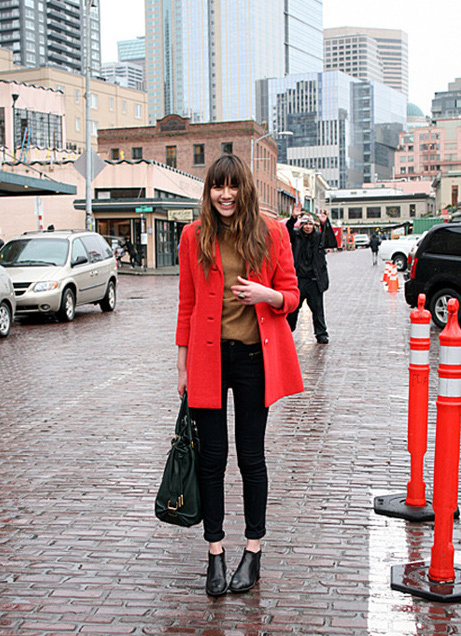 Model and blogger Natalie Suarez (pictured above) proves this point with her red coat. I love how it pulls together her camel sweater and basic black jeans--and makes a very bold and stylish statement.With the end of season sales upon us, I found a few marked down coats that will transition perfectly into next winter. Check them out here, here and here.